Originally hinted at in an information letter from the February 2017 FIE Executive Session, the FIE is reportedly introducing a set of non-combativity rule changes to be voted upon for the 2017-2018 season. 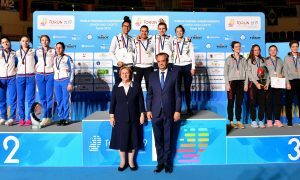 If approved, the changes will be tested starting January 1, 2018 and run through to the end of Senior World Championships. 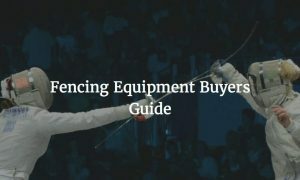 It is yet to be seen how US Fencing will implement this set of rule changes. This article will be updated as more information becomes available. Editor’s Note: For clarity, officially, these changes are still in the proposed stage pending a final vote by the FIE. This article will be updated with more information as it becomes available. similar to saber’s break at 8. Have any thoughts about the new rule changes? 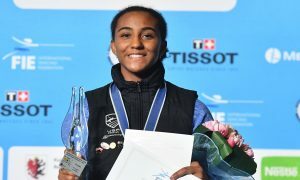 Discuss them here on the Fencing.net Forums! a) The maximum time allowed for each match is 3 minutes. 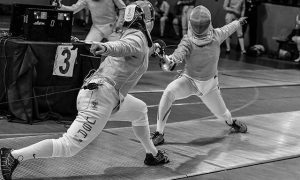 b) Before the match the referee draws lots to decide which fencer has the priority at the beginning of the match. c) If no hit is scored during 45 seconds in the course of the match, the signalling apparatus will be blocked, the referee calls ‘Halt!’ and awards a hit to the fencer who has the priority. d) The fencers are put back on guard at the place where they were when the fight was stopped, the chronometer linked to timing the priority is reset to zero, the priority passes to the other fencer and the match restarts. e) Each time a hit is awarded by the referee, single or double, the priority changes and the chronometer linked to timing the priority is reset to zero. f) The priority also changes when, with the score at 4-4, a double hit is signaled. g) There is no change of priority if, after a hit, there remain less than 45 seconds to fence. h) If at the end of the regulation time for the match, the scores are equal, rule o.17.2.b is applied. a) The maximum time allowed for each match is 10 minutes. b) Two pauses of 1 minute are allowed when either of the fencers reaches the scores of 5 and then 10 hits. c) Before the match the referee draws lots to decide which fencer has the priority at the beginning of the match. d) If no hit is scored during 45 seconds in the course of the match, the signalling apparatus is blocked, the referee calls ’Halt!’ and awards a hit to the fencer who has the priority. e) The fencers are put back on guard at the place where they were when the fight was stopped, the chronometer linked to timing the priority is reset to zero, the priority passes to the other fencer and the match restarts. f) Each time a hit is awarded by the referee, single or double, the priority changes and the chronometer linked to timing the priority is reset to zero. g) The priority also changes when, with the score at 14-14, a double hit is signaled. i) If at the end of the regulation time for the match, the scores are equal, rule o.24.3 is applied. a) The maximum time allowed for each relay is 3 minutes. b) Before the match the referee will draw lots to decide which team has the priority at the beginning of the first relay. The priority at the beginning of each relay then alternates at the beginning of each relay. c) If no hit is scored during 45 seconds in the course of the relay, the signalling apparatus is blocked, the referee calls ’Halt!’ and awards a hit to the team which has the priority. d) The fencers are put back on guard at the place where they were when the fight was stopped, the chronometer linked to timing the priority is reset to zero, the priority passes to the other fencer and the relay restarts. f) The priority also changes when the score is 44-44 and a double hit is signaled. h) If at the end of the regulation time for the match, the scores are equal, rule o.44.9 is applied.